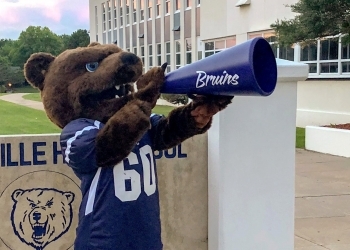 Bartlesville High may not be in the 6A football playoffs on Friday, but some future high school Bruins are getting some postseason experience. The Bartlesville third grade team has made the championship of the Indians Nation League. The Bruins will take on Stillwater in Bixby on Saturday afternoon for the title. The little-Bruins took care of business in the quarterfinals and semifinals rather easily the past couple of weeks. Stephen Lackey is in his second season coaching this young group. He says the presence of Bartlesville High head coach Lee Blankenship has helped the team get over the top. Lackey said his third grade club runs similar plays to the ones you would see the high school Bruins run on Friday nights at Custer Stadium. For his part, Blankenship says he hopes putting in time with coaches and players at the elementary school level will pay off in the future for BHS football. Good luck to Lackey and the 3rd-grade Bruins on Saturday in Bixby.